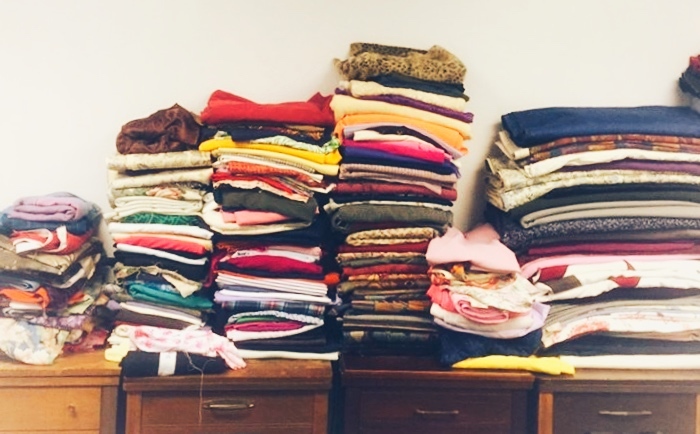 This weekend, Something New volunteers helped organize the Amani Women’s Center sewing room. Dozens of women in the Clarkston community attend sewing classes twice a week, in order to find ways to help provide for their families. Read more here! At New Expression Clarkston, we like to give the kids a chance to do whatever activities they think best expresses who they are. For me personally, art is a way I express myself, so I’ll work with a lot of the young girls who like art too! In art club is has been so amazing to experience new things to and be with the kids. We’ve been doing a lot of field trips lately. I have taken girls in the community to different places like the library, nature parks and playgrounds. It has been amazing to see them each weekend jump into the car so excited for the new adventure. As we’ve been adventuring out of our normal meeting space, we have also met new people in the community. One of my favorite memories recently is when we went to one of the Dekalb libraries and taught the girls how to knit and make bracelets. Different kids would come through and just sit down and participate with us. The girls would help each other and encourage each other in making scarves, hats and bracelets. Everybody felt so welcome to talk and jump right in! 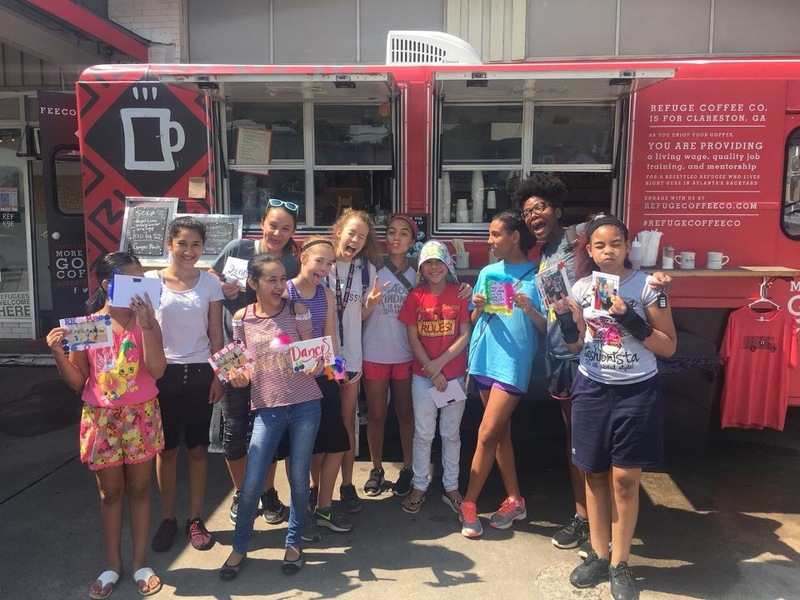 We have loved taking art club out to the community! Trauma- a type of damage to the psyche that occurs as a result of a severely distressing event. This word has become more real and relevant to me as we get to experience the incredible stories of some amazing individuals. 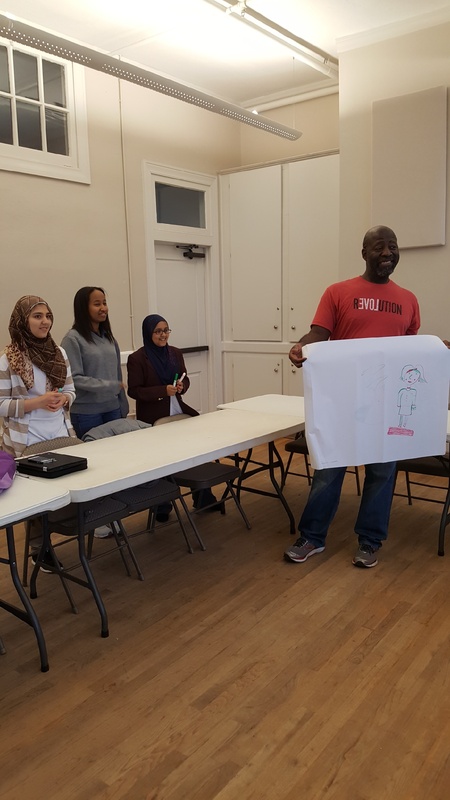 Starting this month, we get to spend time with and teach middle and high school refugee students in Clarkston once a week. The students we teach represent many walks of life from Ghana, Kenya, Korea, Dubai, Sudan, Uganda, Congo and Zambia just to name a few. As we listen to their stories, the reality of their traumatic experiences come to life in living color. The persecution and violence they faced have given me a different perspective in how I view the issues here in the USA that we can address as citizens and New Way trainers. Their stories also continue to validate and reassure me of the work that we do and how much it’s needed. Although the students’ circumstances may leave lasting psychological scars (and physical scars for some), you can feel hope. As we go through activities together, you feel hope arise through smiles and laughter, sometimes even tears. We feel how love touches the human soul and reminds each person of their gifts and value on this earth. These weekly workshops have become one of the most powerful hours of my week as I see love conquer hate and heal brokenness in many. I see those that would not talk laughing uncontrollably with their peers. I see those that could not speak English well, speak the language of love that we all understand. Although my natural experience are not anywhere close to being the same as the students, I am learning that any level or degree of trauma must be addressed with patience, love and understanding. I walk away weekly having learned more than I could ever teach. There is truly a New Way of dealing with the trauma in our lives. We must learn to go through the struggle together because we come out closer and stronger in unity on the other side. We are human! We are love. We are family. Definition: relating to behavior that is considered unconventional and is often seen as a challenge to traditional norms. Something New just wrapped up an exciting spring break season, welcoming over 200 students from 15 schools for an ‘alternative’ take to their spring break. Just days after President Trump’s revised travel ban and continued halt to the U.S. refugee resettlement program, our New Alternative participants spent the week, serving, learning, and training in Clarkston, GA — a new home for many from conflict zones around the world who are seeking freedom and opportunities for their children. Clarkston, GA is known to be the “most diverse square mile in the United States”. The students chose to spend their week participating in Something New’s service-learning program, New Alternative. 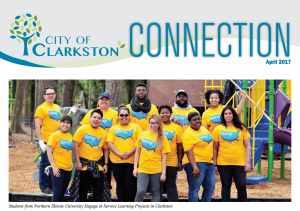 Our groups collectively spent over 360 hours serving in the Clarkston community. 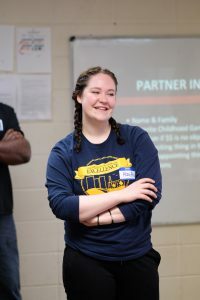 Students volunteered in schools that represent 60+ native languages, and found that it was possible to connect despite language and age barriers. 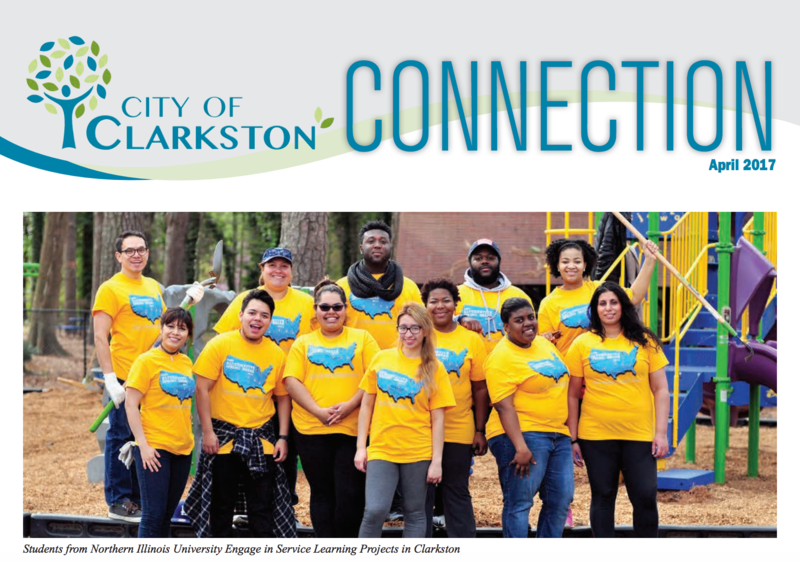 While our students weren’t serving in the classroom or at a local after school program, they were outside preparing community gardens for fresh crops and clearing parks and recreation areas for the community’s use. In addition to service-our students participated in a variety of educational activities. They learned about civil and human rights at The Center for Civil and Human Rights, learned from community leaders during a panel at the Clarkston Community Center, and had an opportunity to learn more about nonviolence and how the nonviolence journey begins within themselves through our introductory New Way training. Student highlights included learning more about refugee resettlement along with learning more about themselves and making new friends. Thank you to everyone who came during March — we are so glad to know you and can’t wait to see you again! Here’s some snapshots from this spring break season. 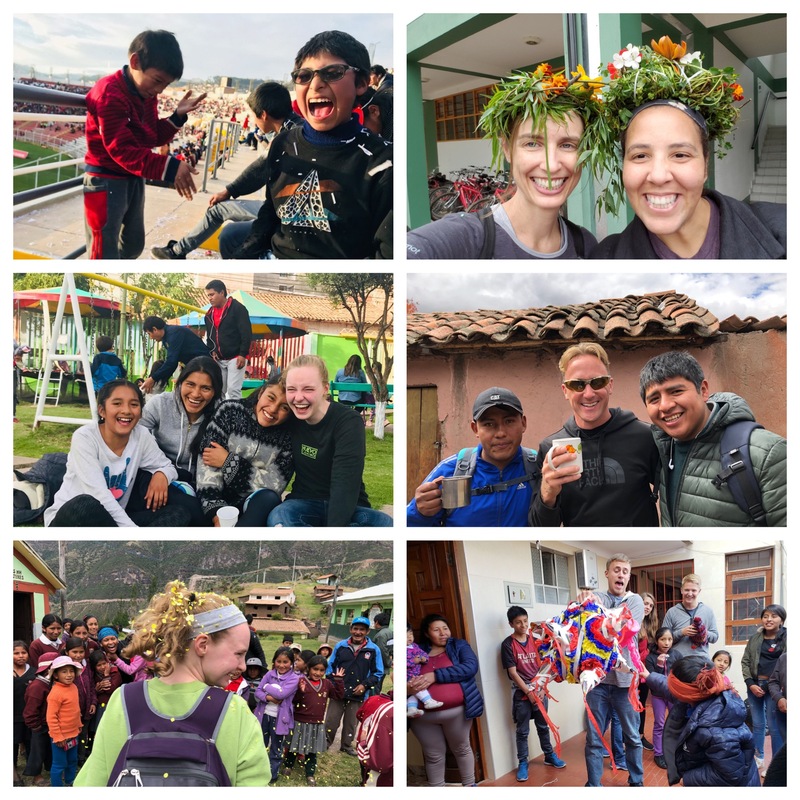 If this sounds like a trip for your college or university, please contact our New Alternative director, Emily Mumford for more information (emily@somethingnew.org). What is the Revolution Summit? The New Way Revolution Summit is open to all—students, professionals, community leaders, and people seeking the tools and knowledge to apply nonviolence as a lifestyle and as a change-generating tactic in a variety of settings. The Summit will focus specifically on equipping college students, professionals, and community leaders to effectively incorporate real-world peacemaking and conflict reconciliation strategies in support of diversity, inclusion, and meaningful coexistence. 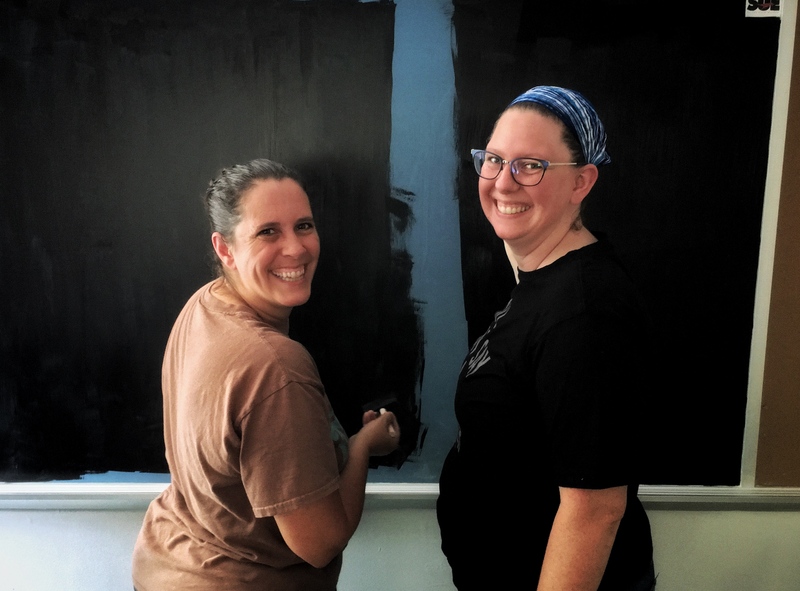 Attendees will get immediate practice applying principles learned in the training room as they engage in direct action and community service opportunities in the Atlanta area. With support from New Way trainers and staff, participants will create personal action plans to take home and will benefit from ongoing support throughout the year. What is the cost and what does cover? The cost of the Summit is $289. It covers the training, material, continental breakfast, lunch, and snacks each day. It does not cover cost of housing or transportation to and from Atlanta. Participants will be sent an invoice prior to the Summit. Register for the Summit HERE. Please note on the form if you’re interested in applying for a scholarship. We will send that application separately.